It comes from our Grand Cru vineyards, planted with Chardonnay and Pinot Noir grapes on the gentle hills of Passirano. After 7 months for the first fermentation in small steel tanks, it rests for about 30 months, aging, maturing and refermenting in the bottle, in contact with selected lees, in the darkness and silence of the Cellar. A magical and romantic Franciacorta, in the balance between the delicacy of Chardonnay grapes and the strength, robustness and complexity of Pinot Noir grapes. Our Noble Rosé, image of the tempting and seductive binomial of Ca’ d’Or, has an old pink quartz colour with orange reflections, given by a perfect processing time, that is a very few hours of cold maceration of Pinot Noir grapes. Made in purity, gives complex, very intense aromas, with clear notes of red berries, tropical fruit and rose petals on the nose. On the palate, the fresh and ample taste, combined with a good body, becomes harmony between sapid and tangy notes, led by a tempting note of red fruits. Very fine bubbles and refined elegance. It has good balance on the finish. the shape is as original as it is useful for the process of aging in the wine cellar; its greater surface area, in fact, permits more contact between the liquid and the lees, allowing the sediment to release essential substances that enhance the expressive bouquet of our Franciacorta and consequently improve its taste and nose characteristics. The date 1501 marked in relief on the glass, recalls the long history of the Ca’ d’Or brand. Class “A” white glass for food products. water colours etched on glass by means of a printing technique using steel frames to transfer the colour directly onto the bottle. The colours used are thermally fused and, after cooking at 600/620 °C, the screen printing is permanent. The colours and processing meet standards for use with food products, and are non-toxic. 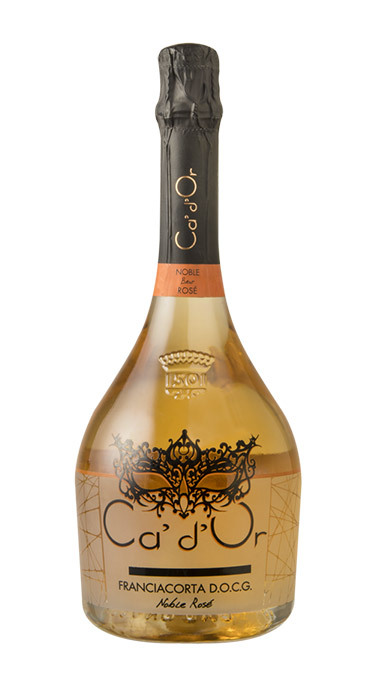 The metallic black colour of the mask, together with the collar in Orange, identify the type of wine in the bottle. an extremely high-quality achromatic cork made of cork microgranules from raw materials selected to preserve the taste of the wine.